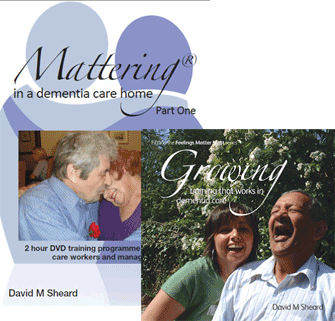 Here you can purchase the whole range of Books and DVD's that Dementia Care Matters has published. Two key resources to train and develop staff in person centred dementia care. "Growing: training that works in dementia care.” Book for dementia care trainers free of charge. See how to put person centred care into practice. Suitable for individuals and full staff teams in training and meetings - to share ideas, inspire others and support change. The Feelings Matter Most series of DVDs include: inspiring interviews between David Sheard and John Suchet, live learning sessions, practical examples, shared personal experiences and honest and open debate. Explore our approach to dementia care with the innovative “Feelings Matter Most” series. Many publications in dementia care outline what needs to change to improve practice, but do not show us how. This series offers practical advice on how to achieve change in dementia care that can be seen, heard and felt. Click here to find out about our current special offers on books and DVDs.